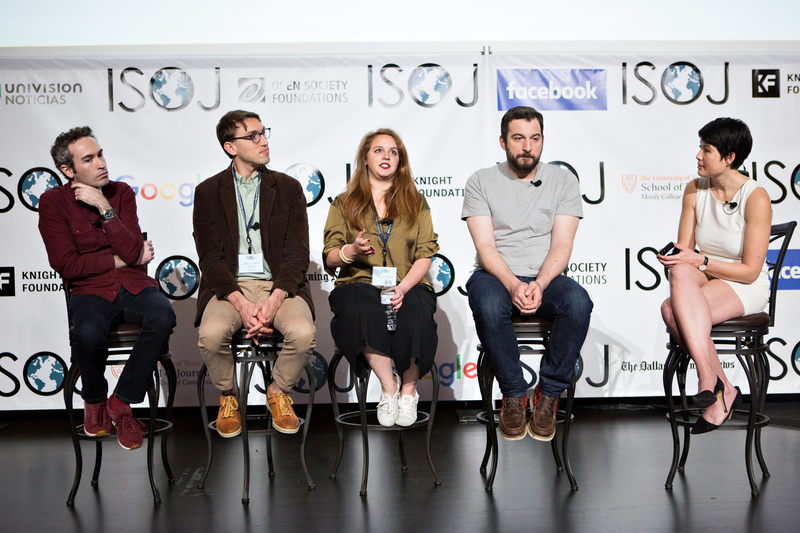 New technologies such as virtual reality, artificial intelligence and machine learning will be important for journalism in the future, and some news organizations are already using them, according to the members of the panel “What’s Next: Artificial intelligence, machine learning, blockchain, augmented reality and other tech trends that will impact journalism” from the 2018 International Symposium of Online Journalism (ISOJ). Deborah Basckin, NBC Left Field producer, presented her mixed reality project, which consists of three to five minute videos in which her team combines real images with virtual reality graphics -mainly, real-time generated data visualizations, made with the Google Tilt tool. Basckin said that Left Field is an example of how virtual reality can be used as a tool, and not as a media’s main platform. The central idea of the project is to create content that is enriched with virtual reality, which results content that is more attractive for the audience than traditional broadcast pieces. Basckin mentioned that the resulting products of Left Field have immediacy, are attractive and can be used in live broadcasts, while at the same time they don’t require a big human team. Augmented reality is on another spot along the virtual reality spectrum, and it is also starting to be applied to journalism. Zach Seward presented what they are currently doing at Quartz, where he works as executive editor. He said that augmented reality -which is defined as a composite view that superimposes computer-generated objects on the real world- is having an important moment in communication. “We see a slew of AR apps come out in the last six to 12 months. And I’m here to argue that this time, the third go around for AR, is for real,” Seward said. “Experiencing [AR] merely requires the phone that is already in your pocket, and that in a nutshell explains what I believe is the real potential and why this is the moment for AR in our industry and in others,” Seward added. Seward said that people are already using augmented reality to communicate with each other without realizing it, through apps such as Snapchat and Instagram. Therefore, media organizations have a huge opportunity in that field. Seward showed the app that Quartz released two years ago for iOS and Android, which reads the news in a conversational interface through a mix of text, emojis, gifs and static images. They added virtual elements that the user can manipulate. “The idea we had was what if we just thought of 3D models as yet another media type that we could put into the mix of our storytelling when it seemed appropriate,” Seward said. The Quartz team has found that not all news requires augmented reality, and also that the topics that best work are those related to sports and space. Seward said that this technology works better with journalistic products that can be planned with enough time ahead of time. As an example, Seward showed the 3D model that Quartz made of the Falcon Heavy space vehicle when it was launched in February this year. Users could put the spacecraft in a real environment, manipulate it and learn about it on their phone screens. In the field of artificial intelligence, Jeremy Merrill, news apps developer at ProPublica, talked about how machine learning technology is useful for the investigative journalism. Merrill defined machined learning as “fancy math that looks like magic,” whose main function is to find patterns among huge amounts of data. For journalists, using machine learning represents having a computer do menial tasks that normally a bunch of interns would do, such as reading big amounts of documents, measuring and organizing data, according to Merrill. Among the examples of journalism where machine learning was used, Merrill mentioned a piece in which BuzzFeed programmed computers to look for spy and drug dealers airplanes among hundreds of flight-tracking data over U.S. airspace. He also highlighted an Atlanta Journal-Constitution story about sexual abuse at the hands of doctors, for which machine learning was used to analyze thousands of medical records looking for words that may indicate abuse. On the negative side of the use of machine learning and artificial intelligence in journalism, Merrill mentioned that people are also using these technologies to manipulate videos and audio. Mia Tramz, editorial director of enterprise and immersive experiences at TIME magazine, presented the projects that the publication is doing through LifeVR, TIME’s platform that offers virtual reality experiences for its publications People, Sports Illustrated and InStyle. She highlighted that the concept is based on the original mission statement of LIFE magazine’s founder Henry Luce, who talked about taking people to the moon, through shadows in the jungle and walking through walls, which they interpreted as experiences that could be brought to real life through virtual reality. Tramz said that LifeVR has published 30 projects since it was launched in 2016. They include a livestream of the 2017 Solar Eclipse in the U.S., which got more than 5 million concurrent viewers. The four-part virtual reality documentary “Capturing Everest,” which takes the viewer upwards from Everest’s based to the summit, earned LifeVR two Emmy nominations. Also, LifeVR created a virtual reality educational experience for the 75 anniversary of Pearl Harbor, in which the user can experience the moments after the attack. Regardless of the nature of the topic, the creators decided not to include gory scenes, although that may leave out a layer of reality. Tramz also gave ISOJ attendees advice to consider - most virtual reality experiences require equipment whose prices are still unaffordable for some people. Like with other new technologies that journalism can lean on, journalists should know which kind of information works with virtual reality and which doesn’t. Plagiarism and misuse of information on the Internet are challenges that journalism will still face in the future. A possible solution to that is Po.et, a system based on blockchain technology (the same technology behind bitcoin cryptocurrency) which works as a shared database, designed to track and protect the copyright and ownership of creative products in the digital world. Po.et is an open source protocol and operates as a nonprofit. Its CEO, Jarrod Dicker, talked about how blockchain technology will impact journalism in the future. The idea is that, when a journalist publishes any written or multimedia content online, Po.et will capture its metadata, timestamp it and store it in a blockchain block. Dicker said that an important point for Po.et is the idea that journalistic content should be easily discovered, and for that it is necessary that the authors feel confident sharing their work on the internet without the fear of somebody misusing it.